We visited Forde Abbey in Dorset recently. It’s an amazing garden and well worth a visit. This is a tall pink Michaelmas Daisy called Harrington’s Pink. It’s a New England Aster and they are well known for producing large colourful flowers on sturdy woody stems. They are also resistant to mildew which other Asters are prone to. There’s nothing subtle about this plant. It’s tall growing to around five feet or so. The flowers and all the insects that love these nectar rich plants are right in your face. Which is brilliant for taking pictures… no bending or crouching required! All the best country gardens have poppies of one sort or another. They may be the ephemeral hardy annuals which seed freely and give a burst of colour for a short while in early June like these Papaver somniferum. 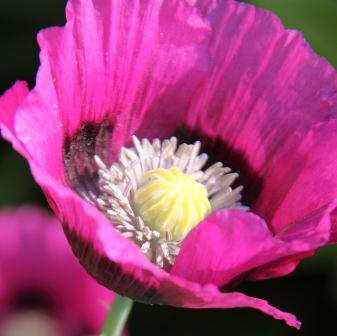 Alternatively they may be Oriental poppies which produce a much sturdier bushy plant and usually flower all summer. Whichever you choose, they are all easy to grow.